Johnson & Johnson dropped 10% in December 2018 on growing concerns about the talc power liability it faces. Read our thoughts on J&J's lawsuit issues here (December 17, 2018). Founded in 1885, Johnson & Johnson (JNJ) is the world’s largest medical conglomerate. With more than 250 subsidiaries operating in over 60 countries, Johnson & Johnson’s three major business units provide it with a diversified mix of revenue, earnings, and cash flow. Pharmaceuticals (50% of sales, 61% of pretax profits): dozens of patented drugs and vaccines to treat oncology, cardiovascular, immunological, neurological, and infectious diseases, and diabetes. Remicade, a treatment for a number of immune-mediated inflammatory diseases, is Johnson & Johnson’s largest drug and accounted for 6.5% of company-wide revenue in 2018. Medical Devices (33% of sales, 29% of pretax profits): surgical, orthopedic, endomechanical (i.e. hip replacements), and sterilization equipment. Consumer Products (17% of sales, 10% of pretax profits): over-the-counter consumer medical and beauty products including more than a dozen mega-brands (over $1 billion in annual sales) such as Johnson & Johnson, Neutrogena, Splenda, Listerine, Tylenol, Motrin, Sudafed, Band-Aid, Aveeno, Pepcid, Benadryl, and Zyrtec. In addition to its diversified product portfolio, Johnson & Johnson offers investors broad international exposure to faster-growing emerging markets in Asia and South America. Johnson & Johnson has increased its dividend for 56 consecutive years, making it a dividend king. Johnson & Johnson's outstanding track record extends well beyond its dividend growth streak. The firm has earned a strong return on capital near 20% for the last decade while generating mid-single-digit sales growth and a steady rise in profits, for example. In fact, thanks to its diversified business model J&J has grown its adjusted operating earnings for 35 consecutive years. Very few businesses ever come close to growing as large as Johnson & Johnson, which generates more than $80 billion in annual revenue. Even fewer companies grow with such consistency and without sacrificing profitability. However, J&J’s management team is very focused on investing only in markets that the company can dominate. Today, approximately 70% of J&J’s sales are from No. 1 or No. 2 global market share positions, and management has shown a willingness to divest underperforming or non-core parts of the business over time. The company also boasts that 25% of its sales are from new products launched in the past five years. With over $80 billion in annual revenue, that means J&J commercialized more than $20 billion worth of new products in five years, or about $4 billion per year. Such results are a testament to Johnson & Johnson’s innovation, brand strength, scale advantages, and R&D processes. In fact, with more than $10 billion invested in R&D activities each year, J&J's R&D budget is among the 10 largest of any company's spending in the world, according to Capital IQ. The firm focuses most of its investments on its high-margin patented pharmaceuticals segment. Johnson & Johnson's disciplined spending on pharma has paid off with no less than 14 drugs being approved since 2011 that went on to generate over $1 billion in annual sales each. That's helped the company's base portfolio of pharmaceuticals grow two to three times faster than the industry historically, according to management. 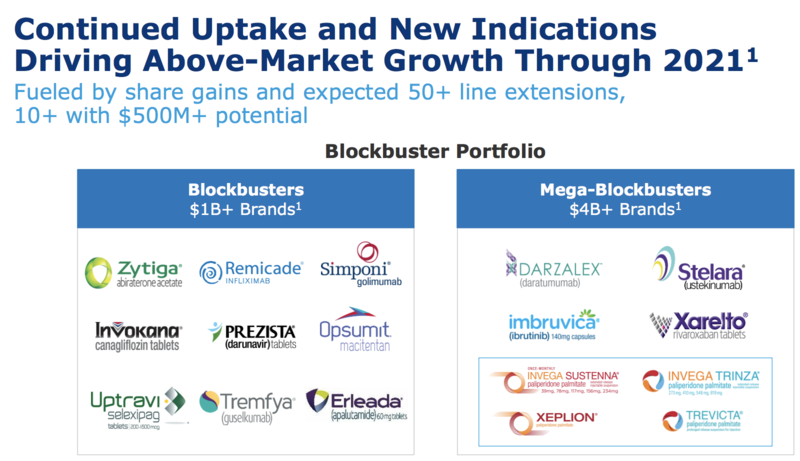 Through 2021 the company expects its drug development pipeline to deliver another 14 blockbusters, including in fast-growing markets like oncology, immunology, and diabetes. J&J's growth plan also calls for expanding indications for already approved winners, some of whom are already generating over $4 billion per year for the company. The firm's strong drug pipeline, combined with management's solid track record of commercializing drugs is why research firm EvaluatePharma expects J&J's drug sales to achieve one of the fastest growth rates in the industry through 2024. Considering Johnson & Johnson's massive size (sells over $40 billion per year in patented drugs), that's an impressive forecasted growth rate. Each of the company’s three operating segments is driven by different factors, with the consumer business providing the most predictable cash flow to fund growth in pharmaceutical investments. This diversification further adds to J&J’s resilience to economic cycles and helps fund innovation and acquisitions. Johnson & Johnson's consumer products are also advantaged thanks to the company's size, which allows it to invest large amounts of advertising behind its strongest and most profitable brands. As a result, the company enjoys strong pricing power that has helped its consumer products sales outpace the 3% to 4% growth rate of the addressable market over the last five years. The global consumer products market is a massive $350 billion in size (compared to J&J's consumer sales of less than $15 billion), which means that this stable business unit should have plenty of runway left to continue providing steady funding for the company’s high-margin pharma business. This is an important advantage because the cost of bringing a new drug through the FDA’s three-stage testing procedure is extremely expensive and time-consuming. According to the Tufts Center for the Study of Drug Development, the 10-plus year approval process costs on average more than $2.5 billion per drugwhen factoring in all post-trial monitoring. As if the process wasn't challenging enough, only two out of every 10 marketed drugs generates enough in sales to at least cover its R&D costs, per the Pharmaceutical Research and Manufacturers of America organization. Increased safety concerns and government regulations add further challenge to competing successfully in this industry. Johnson & Johnson has a solid track record on drug approvals and pumping out many blockbusters over the years. Even better, the company's success is not overly concentrated in any single drug or treatment area, which reduces volatility. Remicade is the company's largest drug and accounts for less than 15% of the pharma segment's sales and under 7% of company-wide sales. Simply put, J&J's pharma segment is a proven, well-oiled machine with a solid drug pipeline and a nicely diversified portfolio of medications. An aging global population, increased pace of FDA approvals of new molecular entities, and growing wealth in emerging markets should all help drive the global pharma market higher over the coming years. Part of management's growth strategy focuses on making acquisitions as well. That includes both smaller, bolt-on acquisitions to expand its consumer products segment, as well as larger pharma deals to refill its drug pipeline, such as J&J's 2017 acquisition of Actelion for $30 billion. Actelion creates drugs to treat pulmonary hypertension (i.e. high blood pressure in the arteries to your lungs) and other rare diseases. As part of that deal, J&J also received Stelara ($5.2 billion in 2018 sales; psoriasis and arthritis) and Zytiga ($3.5 billion in sales; prostate cancer). Management expects the acquisition to result in long-term top and bottom lines sales growth acceleration of 1% and 1.5% to 2%, respectively. While large acquisitions don't always work out and often take years to judge, Johnson & Johnson’s management team deserves the benefit of the doubt due to its strong capital allocation track record. It's also worth noting that J&J is no stranger to large deals. The company bought orthopedic products business Synthes for $21 billion in 2012 and acquired Pfizer’s consumer health care business for $17 billion in late 2006, for example. In total, J&J has acquired more than 100 companies over the past 20 years. Those launches alone are expected to generate $7 billion in annual sales by 2022, which is significant even for a company of J&J's immense size. Across all three business segments, Johnson & Johnson has a total of 26 drugs and product platforms which each generate over $1 billion in sales, giving it the diversification it needs to generate consistent free cash flow and steadily grow its dividend. The company's size, economies of scale, giant R&D budget, product diversification, and pristine AAA credit rating help ensure that J&J has the resources to continue trying to drive at least mid-single-digit growth in its earnings and dividend for the foreseeable future. Despite its diversification, much of the company’s profits are still derived from patented medications, whose patents will eventually expire. For example, take a look at Johnson & Johnson’s largest drug, Remicade (approximately 7% of company-wide sales). Remicade's European patents expired in 2015, and its two sets of U.S. patents expired in 2018 but have already faced real challenges. For example, Pfizer (PFE) in November 2016 gained approval to begin shipping a biosimilar that competes with Remicade, which is expected to reduce U.S. sales of the drug. In other words, J&J’s most important business unit (in terms of profits and growth) is stuck on a kind of hamster wheel, in which new acquisitions and drug development are partially offset by declining medication market share from legacy drugs that lose patent protection. In fact, the loss of patent protection resulted in Remicade sales declining 16% in 2018 to $5.3 billion. The drug's future sales will continue falling fast, putting pressure on J&J to deliver on its drug pipeline to offset the declines in this mega-blockbuster. Combined with the loss of patents on several other key drugs, J&J expects generic and biosimilar competition to serve as a $3 billion to $3.5 billion revenue headwind in 2019. Impressively, thanks to its strong pipeline and diversified drug portfolio, Johnson & Johnson is still talking about overall growth in its pharma business. However, the point is that patent expirations, the timing of new drug launches, and issues like foreign currency exchange rate fluctuations can all make for somewhat lumpy growth rates any given year. Speaking of new drugs, it’s important to realize that even the most promising potential breakthroughs might fail to achieve FDA approval, explaining why the drug industry is often so active with mergers and acquisitions. Indeed, the nature of the pharma industry can create some volatility. Pharma companies spend years of time and hundreds of millions or even billions of dollars developing a drug and it might still fail in the end. This is also what makes M&A so difficult because management has to estimate future drug sales (adjusted for the risk of trial failure) of any target's drug pipeline. The biggest worry investors have is over the talcum powder lawsuits (11,700 total cases), including a major class action loss in July 2018 that theoretically could cost the company $4.7 billion. While J&J has always won these cases on appeal, in December 2018 Reuters reported that J&J had in fact known that its talcum powder contained trace amounts of asbestos. That news sent the stock crashing 10% in a single day, despite the fact that thousands of tests over the decades (including by the FDA, independent labs, and research universities) have shown that J&J's talcum powder doesn't contain asbestos (or cause ovarian cancer). While J&J seems unlikely to lose these major talcum cases, with nearly 12,000 of them pending the company may end up settling out of court. In that event, a settlement might cost the firm several billion dollars (the biggest class action settlement ever paid by a pharma company was $3 billion in 2012). With nearly $20 billion in cash on the balance sheet, J&J could easily cover even a record-setting settlement, though obviously this would decrease the company's financial flexibility in terms of M&A and future buybacks. Another risk comes from the ever-present threat of regulatory changes, either in government healthcare spending (changes in Medicare or Medicaid) or in drug pricing. For example, the Trump administration has proposed to clamp down on high drug prices by allowing Medicare to negotiate bulk drug prices, which up until now it has been prevented from doing. And in late January 2019, the U.S. Department of Health and Human Services proposed a new regulation that could severely curtail drug rebates to pharmacy benefit managers (PBMs), Part D plans, and Medicaid managed care organizations. These rebates, which amount to, on average, 26% to 30% of a drug's list price, are a key strategy that drugmakers use to get preferential treatment on drug formularies. That helps soften the rate at which drug sales decline once patents expire and generic and biosimilar competition hits the market. Pharma companies have also cited pressure to provide ever larger rebates as a key driver behind the need to raise their drug prices. However, in recent years growth in rebates has outpaced drugmakers' selling prices, resulting in net drug prices realized by pharma companies actually declining. While management didn't disclose specific guidance for 2019's net drug prices (after rebates), J&J will likely face rising pressure from insurance companies and PBMs to continue lowering costs. In other words, pharma sales growth will depend on higher volumes (more patients served, more drug launches) as pricing looks to remain a headwind for the foreseeable future. Fortunately, J&J's successful launches and growth of numerous blockbuster medicines position the firm relatively well. In fact, despite the 6% to 8% net pricing headwind in 2018, J&J's pharmaceutical business recorded 12% operational growth. However, if the U.S. ever adopts a single-payer healthcare system (like "Medicare-for-All"), then that could be a game-changing negative for the entire medical sector, especially high-margin drugmakers. Under a single-payer model, the U.S. government would become the sole healthcare provider for everyone. As a result, bulk drug purchases (at steep discounts) and even price controls (like what's happened in several European countries) could be come the norm. While such a scenario seems quite unlikely today, a lot can change between now and the 2020 presidential election. When it comes to buy-and-hold forever dividend growth stocks, they don’t get much better than Johnson & Johnson thanks to its secure payout, outstanding dividend growth track record, unbeatable balance sheet (AAA credit rating), recession-resistant products, and solid long-term growth runway. J&J seems most appropriate for dividend investors looking for very safe income from a stock that will almost certainly let them sleep well at night. The company’s scale, product breadth, cash flow generation, R&D budget, and geographic diversification seem likely to keep the firm relevant for decades to come.